Cincinnati-based American Heritage Girls (AHG), an international faith-based character-development program for girls ages 5 through 18, has joined with Heimlich Heroes to teach its members how to perform the Heimlich Maneuver when a person chokes on food or a small object. The training will be available free to all AHG troops nationwide. (The) American Heart Association and the American Red Cross, do not recommend using the Heimlich maneuver on unconscious patients...Heimlich Heroes, a Cincinnati-based first aid program developed partly by Henry Heimlich, is teaching students to perform the Heimlich maneuver on unconscious choking victims. This means that school children are being taught a medical practice that is not recommended by the American Heart Association or Red Cross, two highly credible public health organizations. To my knowledge, there is no definitive evidence for or against performing abdominal thrusts (on an) unconscious patient. Further, apparently the "unconscious Heimlich" protocol has never been the subject of any published research, therefore it's experimental. Public health and/or liability risk if someone gets hurt? 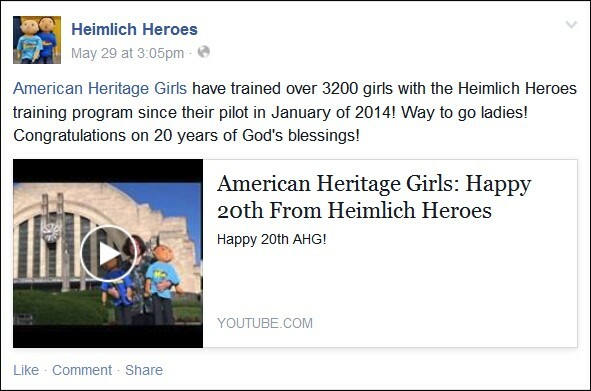 Since the announcement of the Heimlich Heroes/American Heritage Girls partnership last year, I've made multiple attempts -- most recently last week after seeing the above Facebook post -- in order to obtain a position statement and comment from AHG representatives if they're teaching their members to "Heimlich" unconscious choking victims. If they are, AHG is using unwitting kids and troop leaders to circulate an unapproved, experimental medical treatment. I've never received a response from AHG (why not? ), so I just filed complaints against the organization with the IRS (posted below), the Ohio Attorney General's Charitable Law Section, and two organizations that accredit AHG -- the Better Business Bureau's Wise Giving Alliance, and the Evangelical Council for Financial Accountability. I'll report the results in a future item. If any parents of AHG kids or AHG troop members want to jump in, I'd encourage you to ask National Executive Director and Founder Patti Garibay for answers. If you do and want me to consider publishing the results on The Sidebar, click here to e-mail me. UPDATE, 6/16/15: According to their website, the AHG is endorsed by a number of religious organizations, so yesterday I sent similar letters of concern to two of them, the Archdiocese of St. Louis, MO and the Lutheran Synod of Missouri.